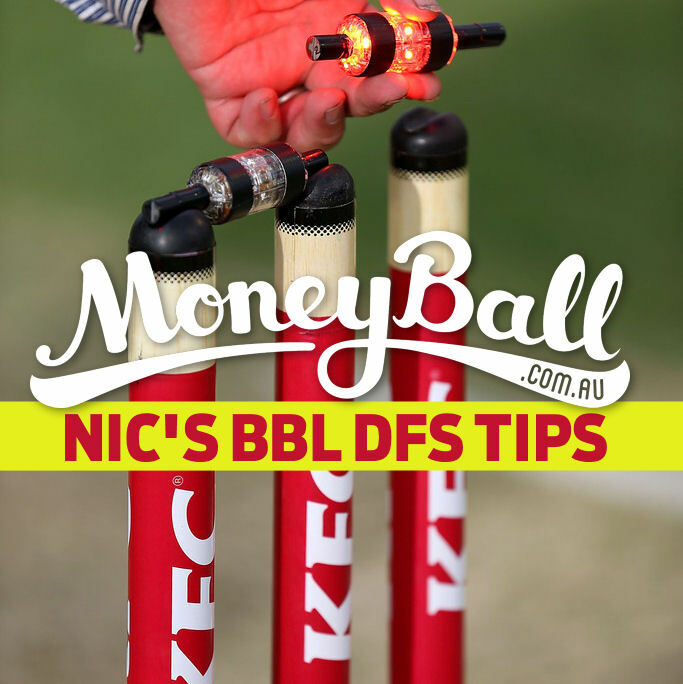 With $5,000 up for grabs, tonight’s match between the Brisbane Heat and the Melbourne Renegades should give you plenty of reasons to get excited. There are plenty of Moneyball options here so let’s break them down to give you an advantage over the rest. After starting the competition in white-hot form, Ross hasn’t looked as good without Lynn in the side. He seems suited to dominating the middle overs and with Lynn seemingly back in the side, Ross should be returning to the role he’s so good at. I could talk about the Bash Brothers here, but everyone knows what they can do. Ross is averaging 25 at a strike rate of 120 and is just as capable of scoring big if given time in the middle. Harris has averaged 26 with the bat this season and has embraced his role at the top of the order with Aaron Finch unavailable for selection. He’s an opening batsman who’ll cost you nothing and is just as likely to produce as anyone priced above him. Short has scored 44 runs in his two stints opening the batting for the Renegades and has looked immediately comfortable at this level. Given his basement price, you could easily throw him in as your flex option or as your third batsman. Maybe wait for the batting order to be revealed tonight just to be sure he’s still opening. Avoid: Matt Renshaw ($6,200): Just be wary of someone who hasn’t played a game in the tournament yet. There are better options available. Smoky: All three guys above. You have two awful options here and it’s unlikely either of them gets significant time in the middle. Peirson has been dropped down the order and Ludeman has faced 30 balls in nine games. I’d be picking Peirson because he saves you $1,000. That’s the only reason. No one will win in this position. Bravo may only be behind Lynn in terms of price in this game, but with so many opportunities to save money elsewhere, he’s clearly a player you should be looking at for your team. Bravo has taken 14 wickets for the tournament and should have a greater batting role with the Renegades missing so many key players. Pollard has been underutilized so far by the Renegades, bowling four overs across two games, but still taking three wickets. He’s also only faced 31 balls and a guy this talented should be doing much more. For this reason, I’d pick Bravo ahead of him, but Pollard would make a strong flex option. Steketee may be the most expensive bowler in this match, but he’s good for a wicket per game, taking nine wickets so far in the tournament at a bowling economy of 8.65. He’ll also get the new ball against the likes of Short and Harris and that gives him a great chance to take early wickets. Shah has taken five wickets at an economy rate of 6.46 and is about as reliable a bowling option as you’re going to get in this game. He’ll once again carry the load as the Heat’s best bowler and you can back him in for a wicket or two. Richardson hasn’t quite been the strike bowler the Renegades would’ve hoped for, only taking the eight wickets across nine games, but he has been economical, conceding 7.97 runs per over. A bowler of his quality should still be more expensive than what he’s priced at and that makes him decent value. Avoid: Jon Holland ($3,400): If he does play, stay away. The power hitting of the Brisbane Heat will be too much for his style of bowling. Smoky: Josh Lalor ($5,000): If named, Lalor is a consistent contributor who takes wickets and would be a nice point-of-difference option for your team.